NASA has ended a Mars simulation in Hawaii, where a team of six people lived in near isolation for a year. Since August 2015, the group lived in close quarters in a dome, without fresh air, fresh food or privacy. Experts estimate that a human mission to Mars could take between one and three years. 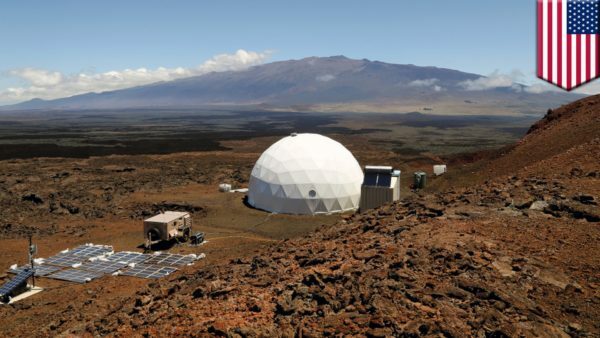 The NASA-funded study run by the University of Hawaii is the longest of its kind since a Russian mission that lasted 520 days. Having survived their year in isolation, the crew members said they were confident a mission to the Red Planet could succeed. Cyprien Verseux, a crew member from France, told journalists: “I can give you my personal impression which is that a mission to Mars in the close future is realistic. The team consisted of a French astro-biologist, a German physicist and four Americans – a pilot, an architect, a journalist and a soil scientist. The NASA experiment dealt with the human element of exploration. Whilst conducting research, the six had to live with limited resources, wear a space-suit when outside the dome, and work to avoid personal conflicts. They each had a small sleeping cot and a desk inside their rooms. Provisions included powdered cheese and canned tuna. Missions to the International Space Station (ISS) normally only last six months.